Book of Mormon – Theatre Review | That's So Rad! Down here, it's our time. It's our time down here. What do you get when you mix the writers of an animated series that follows cartoon children on foul-mouthed adventures with a Broadway musical comedy about two mismatched Mormon missionaries sent to Uganda to spread the word of Mormon? A nine-time Tony Award winning musical that will leave you laughing so hard that you will likely forget that the parody is as offensive as it is hysterical. “The Book of Mormon,” first staged in 2011, is written by Trey Parker and Matt Stone, best known for creating the animated comedy “South Park” teamed up with co-composer/lyricist of “Avenue Q,” and more recently, “Frozen,” to make this match made in heaven. 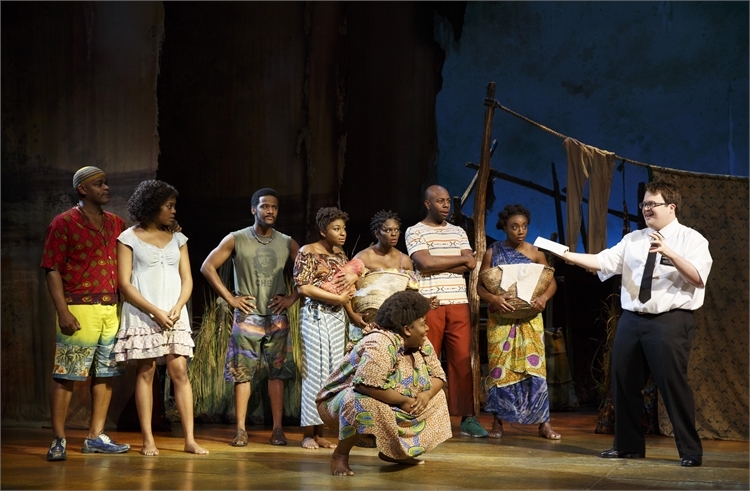 In this musical comedy, no one is safe from ridicule as the play satirizes the Book of Mormon and religious history as well as many other religions, beliefs, faithful practices, public figures and the good people of Uganda. 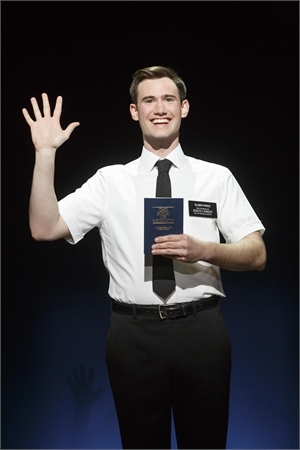 “The Book of Mormon” tells the tale of two typical Mormon Missionaries, Elder Price (Broadway alum Gabe Gibbs) and Elder Cunningham (Connor Peirson) as they go door-to-door ringing doorbell after doorbell in their black slacks, white shirts and black ties hoping to share the words of the Mormon faith to anyone willing to listen. Elders Price and Cunningham, alone with the rest of the Mormon ensemble, start the show off with the fun and witty “Hello!” The magical day that both young men have been waiting for comes when they receive their missionary assignments to travel for two years and share their book of scriptures with their new community. Elder Price is the ideal Mormon missionary, faithful and proud but none too happy to get teamed up with the dopey but loveable Elder Cunningham. It turns out that Cunningham is just looking for acceptance and a friend and he’ll take it any way he can get it. As the pair set off to meet with the other missionaries already set up in Uganda, another less than ideal situation for Elder Price, he sings the beautifully self-indulgent song “You and Me, But Mostly Me.” It turns out that not only has Elder Cunningham never read the Book of Mormon that they are attempting to preach to the citizens of Uganda, but the locals are also preoccupied by things such as AIDS, famine, oppression, and well, maggots. Comedy ensues as the faithless Uganda villagers explain that they deal with their problems with one simple song “Hasa Diga Eebowai”, which is a much more rated R version of the famous “Hakuna Matata” of The Lion King fame. All of this becomes too much for Elder Price, so Elder Cunningham decides to man up and use his imagination, including references to many pop culture sci-fi movies to convert the young and open-minded Nabulungi (Leanne Robinson) and perhaps the rest of the villagers to the Mormon Faith. Will the missionaries successfully turn the downtrodden Uganda Villagers into faithful Mormon followers or will the doors continue to slam in their faces? One thing is for sure, you’ll be laughing regardless. With a songbook filled with jovial spoofs, spectacular choreography and an epically talented cast of characters, the entire production is a phenomenon you must see to believe. The Book of Mormon isn’t for the weak of heart or the easily offended, but even those who may typically look the other way at inappropriate comedy and obscene language will probably still be splitting their sides as they watch these poor, faithful but hapless missionaries try to win over the villagers living in Uganda. Go now to see the show everyone is talking about. Also, be on the lookout for the full-page ad for the real Book of Mormon on the current national tour at the Pantages theater through July 9. If you can’t beat them, join them and make sure you have a good laugh while you’re at it! This entry was posted in Reviews, Theatre and tagged book of mormon, discover hollywood, reviews, theatre, theatre reviews, writing, writing portfolio. Writer, Artist, Creator. Here I write what I want when I want because I write for me. If you want me to write for you, create for you, I will gladly write what you want, when you want, because I'll write for you and then share it here. I ♥ my cats more than most people. By that I mean I love my cats more than most people do but by that I also mean I love my cats more than I like most people. I like horror movies and mythical things and serial killers and Disney ... to name a few things.